Park North and Lion Cub Story Time was this week! The theme was MONSTERS! Had my Monster Themed Storytime playlist playing from Spotify. You can search for it if you are a Spotify user. 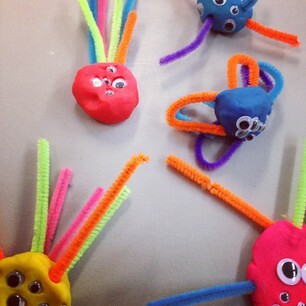 Made monsters from the “build a monster kit” everyone got – a little baggie with playdough, pipe cleaners, and googly eyes. Another great idea picked up from Pinterest (from this blog). Snack was Monster shaped fruit snacks. 1 Response to Monster Story Time!